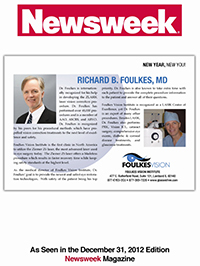 Hi, I'm Dr. Richard Foulkes, the medical director of Foulkes Vision, and I want to welcome you to our site. 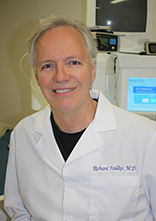 We offer this website as part of our effort to educate our patients about visual enhancement and believe it to be one of the best sites anywhere for getting beyond the hype about refractive surgery. This website will inform you to how LASIK, and implants can help make you glasses free. Accurately measuring the uniqueness of your visual system is vital to the success of the procedure. We have state-of-the-art technology to determine that your eyes fit a model with the highest probability of success. Take the time to read about these advanced technologies like Orbscan II and wavefront analysis, as well as our methods for pupil measurement and tear film analysis. Our techniques have many unique features that were developed here and derived from our continuous attempt to perfect these already excellent procedures. For example, read our Ocular Surgery News article from last year describing our solution to corneal thickness issues. We develop patents on devices and do research to evolve the minute details of this procedure in which microns can make the difference in your success. We want you to be confident in our abilities before you make the decision to have a refractive procedure and to feel that we are partners in this process. Your safety is our passion. We hope that the information we provide here will help you better understand the options available today and help you in making the right decision for your eyes.